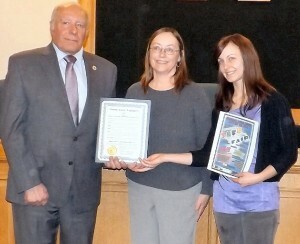 County Legislator Morris Sorbello presents the proclamation to Teresa Woolson, center, and Sarah Gauger, of the VOW Foundation. OSWEGO, NY – The VOW Foundation is gearing up for the second annual SAFE Fair. At its April meeting, the county legislature honored the Substance Awareness Family Education (SAFE) Fair with a proclamation. This fair will also offer “a lot of fun things” for children as well as adults, she added. Information will be provided from at least 16 organizations at the event, which will be held at the Oswego Elks Lodge on April 26 from noon to 5 p.m. The VOW Foundation is a non-profit organization named in honor of Victor Orlando Woolson who died in 2012 from a fatal reaction to synthetic drugs. Board member Sarah Gauger displays a VOW Foundation exhibit. Activities being planned for the fair include: DJ Music by Mystic Music Entertainment, carnival games with prizes, face painting, Children’s Museum of Oswego play areas, a coloring contest, poster and Instagram contests and a free drawing for an Apple iPod. A variety of raffle baskets and a bake sale will also be available to benefit the VOW Foundation. The Elks Lodge will have its kitchen open for food. Exhibitors will have a chance to speak about their services. The contest winners will be announced at 4 p.m. followed by raffle drawings and Apple iPod drawing, Woolson said. Event sponsors include Key Bank, Pathfinder Bank, EJ Construction Group, Carolyn Rush, Farnham Family Services, Oswego Elks Lodge, Mystic Music Entertainment and Media Sponsor News Channel 9. “This is a free event for the entire community. 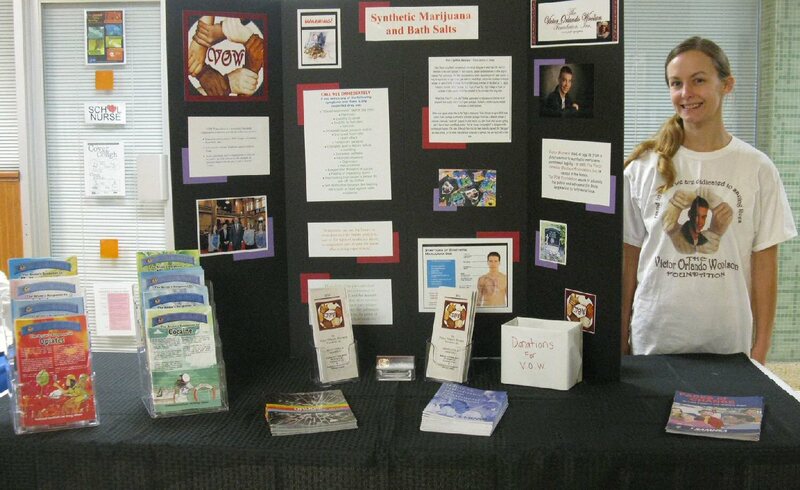 It’s a drug-free and alcohol-free event,” Woolson said. For more information or to donate to the VOW Foundation, please call Woolson at (315) 402-6119.